How cute! I love it's eyelashes...and perfect sentiment! And it's mine, all mine... (evil laugh muwhahahahahaha!) Just kidding. But it is mine. It's so cute! I had to feature it on my blog. Isn't Chrissy the sweetest? So cute Chrissy! Great idea. very cute card!You are so thoughtful! Totally adorable,I'm sure your friend loved it!! I love the story behind the sentiment, it is gorgoeus Chrissy. 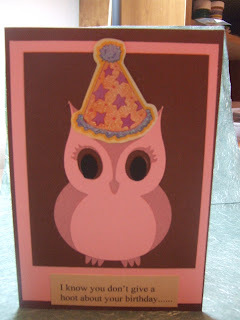 Your friend is a lucky girl .......this card is so Cute ! !